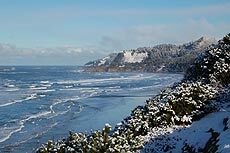 (Oregon Coast) – It depends whom you talk to: Oregon coast tourism on this normally busy three-day weekend suffered because of the snow, or it didn’t suffer. Like the weather, it was a mixed bag of responses. This MLK Day three-day weekend usually brings people out in droves to the Oregon coast, unless the skiing is exceptionally good. In that case, many head for the mountains. Consequently, many businesses weren’t expecting a tsunami of activity in the weeks leading up to the holiday. While the weather really put the skidmarks on expectations, many in the tourism trade had a decent weekend and were pleased. Indeed, driving was precarious on much of the coast because of ice and snow. Everything from Newport to Astoria was in a dangerously frozen state Wednesday, causing accidents and drivers who were at a crawl. 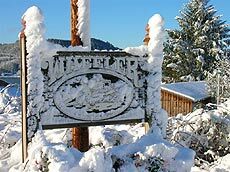 The roads on the central coast cleared up within a couple days, but the north coast – especially Manzanita, which received about a foot of snow – was like a slip ‘n’ slide most of the evening hours all the way through Sunday night. THE TIDES BY THE SEA, Seaside. For over 80 years a favorite of Seaside visitors. 51 oceanfront condos, individually owned and decorated. Suites for couples, small apartments with fireplaces and kitchenettes, one or two bed family units with fireplaces, kitchens and dining rooms. 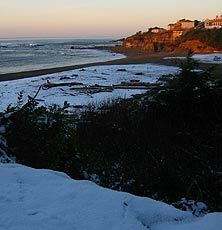 Oceanview cottages sleep anywhere from two to eight, w/ two bedrooms, some with lofts, fireplaces and kitchens. Heated outdoor pool, enormous grounds w/ picnic tables - all at quiet southern end of Seaside. 2316 Beach Drive. 800-548-2846. www.thetidesbythesea.com. 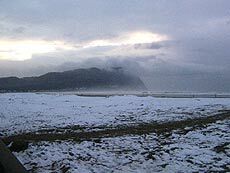 On Friday and Saturday, the daylight hours were fairly easy to traverse between Tillamook and Astoria. 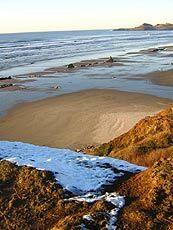 But at night, things were quite icy, especially in the stretches between Wheeler and Cannon Beach, and parts of the highway south of Seaside. 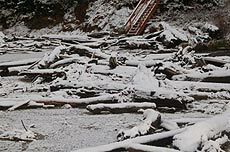 Saturday’s rain warmed the roads considerably during the day, but later at night the areas around Manzanita, Nehalem and just south of the Arch Cape Tunnel were nearly unpassable as that same rain froze over. 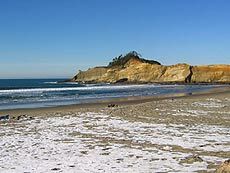 On Sunday, most stretches of 101 were clear, except for portions of the area just south of Tillamook, Neskowin and stretches of the Three Capes Loop around Pacific City. Lincoln County roads were all clear by this time. In Manzanita, where the worst conditions existed, San Dune Inn owner Brian Hines was surprised it didn’t make a bigger dent. “It evened out, between cancellations and walk-ins,” he said. “Three room nights versus the five we wound up with, so we did benefit a bit. “A couple of hunters, one couple not wanting to go back down the hill tonight: no one specifically mentioning coming to see the snow, although they took advantage of it when they were here. Nearby, in Wheeler, Winston Laszlo had plenty of nice surprises for the weekend at his stately Old Wheeler Hotel. “We were surprised that we didn't get any cancellations,” Laszlo said. “I was bracing for some. And it's hard to say if some folks were frightened away from making a reservation by the weather reports and the thought of the roads. But everyone who had made a reservation kept it. Maybe the fact that the roads were promptly plowed and sanded by dear old ODOT had something to do with it, but we ended up with a very strong weekend. Laszlo snapped a particularly lovely set of shots for BeachConnection.net that illustrated this point. The same experience was had by Danielle Emerick at Starfish Point in Newport, though she didn’t think people were making a massive exodus to see the snow either. How your business did depended on your product, however. Ice cream vendors didn’t fare so hot, like Mike Exinger of Seaside’s Zinger’s Homemade Ice Cream. Exinger, like many coastal folk, is of hardy stock, and doesn’t like to go down without a fight – even if it’s a small verbal jab with a humorous side. “Alaskans eat more ice cream per person than any other state,” Exinger said. “So cold has nothing to do with it!